This may be the oddest review I have done yet here at Speedreaders. 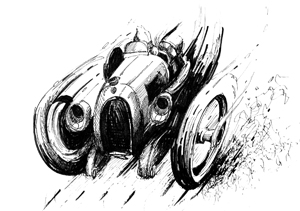 It is not about cars, trucks, busses, planes or trains—but as Speedreaders has grown beyond these topics, this is not where the oddness lies. This is not a book—and I will neither touch upon the complete thirteen-disc CD box set that includes The Beatles nor will I say much about the music therein. 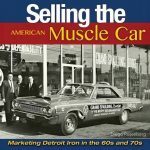 My reason for not reviewing the complete set has to do with the tremendous scope of the project; it would take a good-sized book to do it justice. And my reason for not working with the musical content is that this has been covered in-depth, through the decades, in many, many reviews, articles and books. Truly I doubt that I could add anything of real substance. Therefore, I wish to narrow the focus appreciatively, to concentrate on the packaging, the presentation. 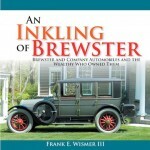 Those of you who regularly read reviews on this site may have noticed that Speedreaders has a knack for offering not just commentary and opinion of the content of a given work, but always has an eye for a book’s appearance, its graphic design, the overall look and feel of the binding, the endpapers, the way the text and illustrations appear upon the page. We bring out the microscope. We feel that this is important. Here, now, is an attempt to deconstruct the substance of the text, using the term in its broadest, most academic sense, the text in this case being this single unit of this elaborate CD Box Set. 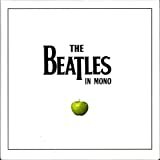 The Beatles has been around forever and this is but another repackaging (if you sold it seventeen times, why not again? ), but it is also appropriate to think of this new package as an example of the craft of design, as a work of art in its own right. But to go on about one CD may seem of questionable importance—and here we have reached at this point in time when even “CD” seems a quaint anachronism, a fading petal if you will, but as this project, here under review, takes the development one step further by reproducing what had been included in the original LP release, it is worthy of notice. What is most salient for argument here is that the speed in which we move through cyberspace, through networks, search engines, and now even one’s personal cloud, keeps escalating exponentially, thereby causing this tribute to antediluvian pre-CD times, the Vinyl Era, this examination of this 2009 recreation of this critically-revered album, to seem somehow both up-to-the-minute and sadly, ridiculously, retrograde. 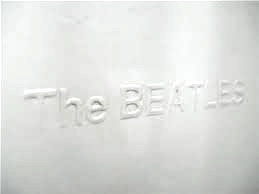 The Beatles, aka The White Album, has been released and rereleased quite often since its debut (November 22, 1968 in the UK, three days later in the US). The LP packaging was generally good but some of the CD packages were chunky, unattractive. The original release, a double vinyl album with a gatefold cover, was numbered on the obverse, digits representing serial production figures. Recently number 0000005 (the UK release in monophonic) crossed the auction block for £19, 201. 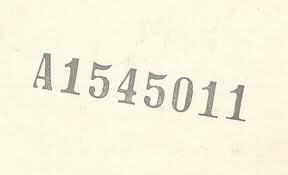 Numbers 0000001–4 had been reserved for Ringo, George, Paul and John (some sources say each received a copy numbered –1). Both monophonic and stereophonic versions (there are slight variations in the music between some mono and stereo tracks) were numbered, and understandably collectors are eager for the low-numbered LPs. Taking a thumbnail down the right edge to slice then remove the cellophane from the white-on-white cover. Carefully sliding the first disc out of the cover then out of the inner sleeve. And how very groovy it was to find some extras in the package: Individual 5 x 7” portraits of each of the four, glossy, good stock, suitable for framing. A 23 x 34” poster, a montage of photos, some of them unprofessionally shot as if from the Fab Four’s personal albums; and a John Lennon doodle, a foreshadowing of the infamous Two Virgins LP cover. 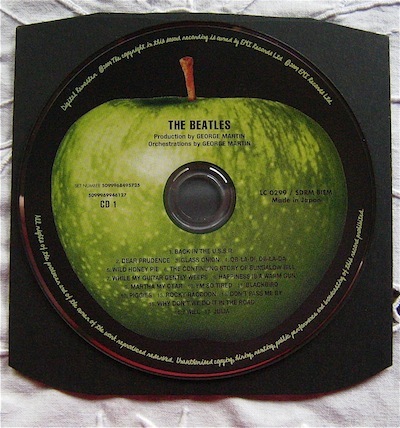 On the reverse are the lyrics of the songs, all original Beatles material. Holding the LP carefully by the edge, cautiously placing the disc on the turntable, sweeping the grooves with a Discwasher® sprinkled with cleaning solution, and hearing these songs for the very first time. Please remember that the music was brand-new then; the Beatles, although the beginning of the end was in sight, were still at the apex; they could do no wrong. Listening, absorbing, reading lyrics along with the music, perusing the montage, hefting the white cover, admiring the restraint, the understatement of the graphic design, opening the gatefold to check the song titles and sequence and noticing that the four pictures of the inner cover were smaller black-and-white reproductions of the four, color, bonus photographs. 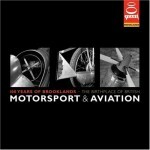 On the front cover, the title is embossed, not printed. Inside, on the left side of the gate, printed in the same silver font as the original, smaller of course, is the track listing. On the right are the four black-and-white, individual photos, one for each group member. The stock is glossy and has a luxurious feel. The tiny spine is labeled with the color and font that mimics the original. 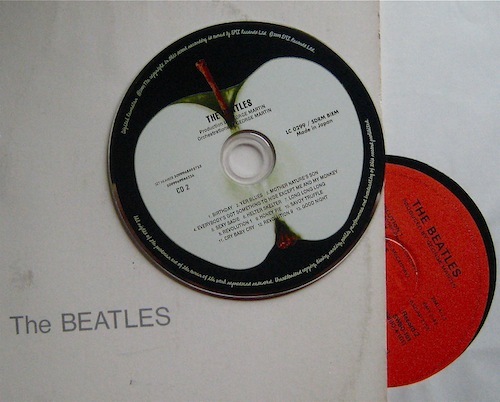 The CDs are to be removed from the top of each gate, rather than the sides, like the rarer UK LP first editions mentioned above. Each CD nicely rests in a miniature black paper inner-sleeve, each corner slightly beveled, for ease of sliding in and out, and supplied with an inside protective clear plastic sheet. Each sleeve is die-cut with a center hole that partially exposes the CD label, a rendition of the ineffaceable Apple label: CD 1 green and ripe, CD 2 sliced down the middle, white and sweet. Seeing again the cursive font circling the apples, spelling out the copyright information, alone can bring about a strong wave of exultant remembrance. Interestingly, a CD itself is just a mite larger in diameter than original LP labels, and this too adds pleasantly to the journey back and forth between the then and the now. The bonus material is also found in the pockets. The poster is scaled down to 9 ½ x 14 1/2” and is folded into sixths as is the original and the four color photographs are reduced to 3 7/8 x 5″ and are bordered in white, again, as are the originals. And, to complete the package, it all folds up into a handy, flapped, clear plastic envelope. 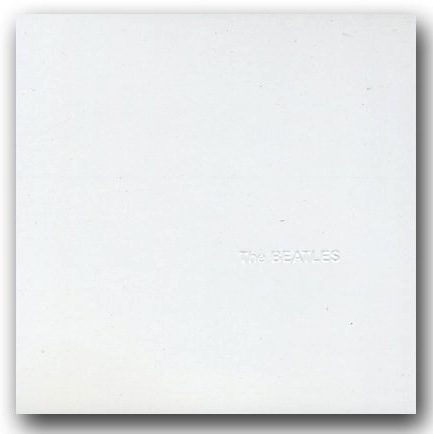 Because of necessary labeling changes and the factoring of size differentiation from LP to CD, some details cannot be exact, but overall the complete package, with its attention to detail and its homage to all that The White Album means—still—to so many, is a masterpiece of miniaturization. Ah, and the music itself. . . . 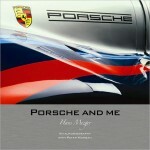 Format: Box set, limited edition, original recording remastered.